Winter garden landscaping is a term that many homeowners in the tri-state area may not be familiar with. It seems like the biggest contradiction: to still have a garden throughout the harshest winters on the east coast. But with the help of careful planning with architects and landscape designers, a winter garden is really a plausible an attainable concept. Since the winter season stretches the longest, winter garden landscaping is used to create interest on your property all year long. With the use of proper specimens, we are able to create textures and colors that thrive in the cold weather landscape. Since flower sequences only cover a short span of time, winter garden landscaping is used to maintain interest through every month. The plantings used help to create scenes that last in fall and through winter seasons, even once all the flowers fade away. This type of landscaping is popular in throughout the Northeast region for this purpose, to ensure the landscape doesn’t appear barren and desolate for half of the year. In winter garden landscaping, there are many popular specimens you will see used time and time again. Blue spruces and boxwoods will withstand the cold elements and maintain the garden structure on any property. Different textures of evergreens are often used such as cryptomerias, arborvitaes, spruces, and pines to create depth and interest throughout the yard. Ornamental grasses are also often used as a textural element and planted in masses to withstand through the winter as surroundings plantings fade away. It creates a nice prairie style and an aesthetically pleasing property even through the coldest months. 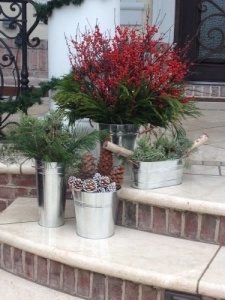 Container gardens are also prominent in the winter months. 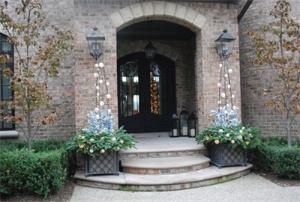 Using pots and planters on front steps, stanchions, piers and around a closed pool are an easy way to add color and interest in the coldest season. Winter garden landscaping elements are used in container gardens as well, select specimens are chosen and arranged in the space to give bursts of color and textures. They can easily withstand the cold months and bring warmth to your property.